Contributor Jacquie Allen didn’t see the power of Places in the Heart coming. And it triggered some past familial memories. I often enjoy keeping the movies I’ve been assigned a secret from friends and family before my reviews are published. Places in the Heart made this incredibly easy for me, as that title is one of the most utterly generic I’ve ever heard and easily slipped my mind any time somebody asked. That being said, the film has an incredibly interesting history behind it, although not for reasons having to do with its content. A little background: 1984 had a mini-boom of films in a sub-genre that can only be described as “farming dramas.” Three films in this specific oeuvre were released that year: the aforementioned Places in the Heart, Country, and The River. All three had their female leads Oscar nominated in the Best Actress category in 1985, with Sally Field taking home the coveted prize for her role in Places. This was Field’s second Best Actress win in five years, after her performance in Norma Rae. Much like her role in the previous film, she plays yet another “strong-willed woman determined to beat the odds.” However, if a certain type of role works, I say keep at it. Obviously, it did work for Field, as she got two Oscars out of it. That’s not what makes it fascinating, though; while it’s considered as some of her best work on the screen, the acceptance speech Field gave upon receiving her second Oscar is downright infamous. If you’ve ever wondered what spurred her over-excited, largely parodied (and usually improperly quoted) “you like me!” speech, which has gone down as one of the most memorable moments in Academy history, it was due in no small part to the dry period she experienced between Norma Rae and Places in the Heart, when she thought Hollywood no longer cared. The tone of the script written by Robert Benton (Kramer vs. Kramer) is somber. Field plays Edna Spalding, a wife and mother living in depression-era Waxahachie, TX. It opens with her family being interrupted at dinner by a deputy fetching Edna’s husband, Sheriff Royce Spalding (Ray Baker), due to a disturbance in town. He assures her he “won’t be gone long.” A line like that is often a harbinger of death. Sure enough, Royce is almost immediately killed in a freak accident. 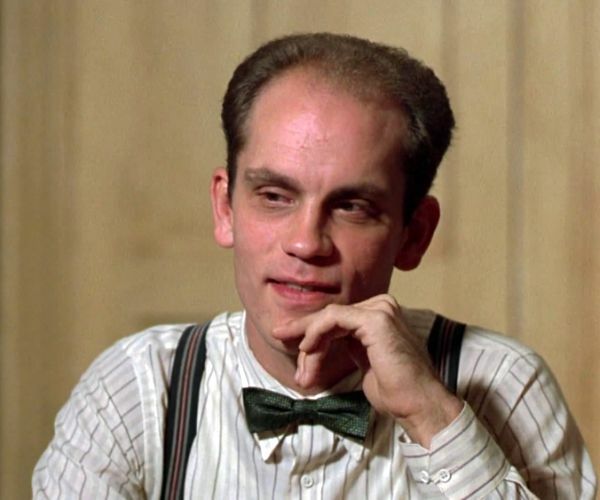 Left to fend for herself and her children without any way of bringing in money and the bank demanding her mortgage payment, Edna struggles until drifter Moze (a phenomenal Danny Glover) comes knocking on her door, looking for work. He tells her that the land she is living on is great for growing cotton, but she eschews his advice and sends him on his way. While leaving, he steals a handful of silver spoons, but is caught later that night. 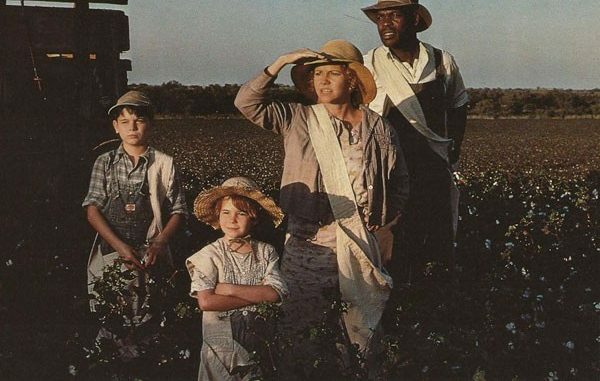 When confronted with his crime, Edna acts much like the bishop in Les Miserables and covers for him, in exchange for his help in planting and picking cotton. They are soon joined by blind boarder Will (John Malkovich) and, despite their drastically different lives, they begin to form an almost familial bond. Pretty much the entire plot is driven by Murphy’s Law: anything that can go wrong for the characters does. The central dramatic arc that revolves around Edna is engrossing and the film moves along at an excellent pace. 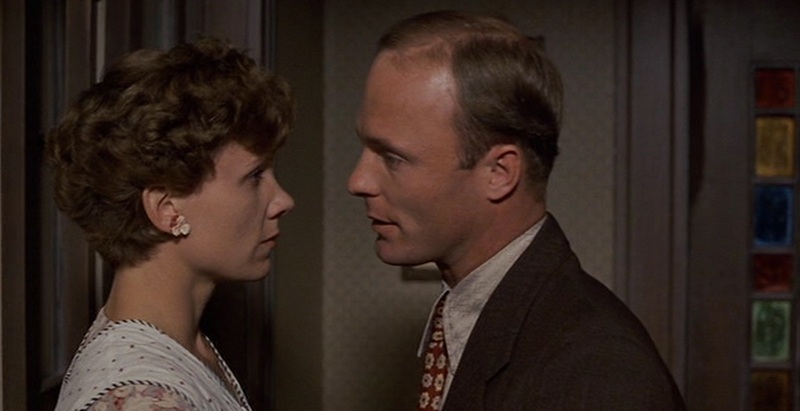 The only real missteps are some scenes that would have helped develop Malkovich’s character further and an unnecessary filler subplot involving Edna’s sister, Margaret (Lindsay Crouse) and her philandering husband Wayne (a wasted Ed Harris). It goes nowhere, does nothing to further the plot, and feels like it’s there just to pad the run time. Despite these few snags, there are several standout scenes. One that comes to mind in particular is Edna being taught to write a check. This echoes tales I’ve been regaled with in the past about elderly female family members of my own who had to be taught what today would be considered simple things, such as how to pump gas, after the passing of their husbands. While these may be extreme examples, it is one of many thought-provoking moments that people can relate to even today. Released by Twilight Time, the print on this limited edition Blu-Ray of Places in the Heart is pristine and really highlights Nestor Almendros’ excellent cinematography. It is, however pretty light on the special features. It only includes a commentary track with Sally Field and film historian Nick Redman, the original theatrical trailer, and an isolated score track (which is a bit confusing, as it is not a very score-heavy film).